Chimney are a very important part of the heating plant in homes where winters are cold. But unless they are properly constructed and regularly inspected they can become a fire hazard. Defective chimneys are one of the leading causes for residential fires. Are you endangering your home by failing to check your chimney? An unsafe chimney is often one that has no lining in the flue or the enclosed passageway for the smoke. The chemical action of the fuel gases on the unprotected brickwork causes a gradual disintegration of the bricks and mortar. A flue lining provides protection from this action. Disintegration of the masonry and the effect of temperature changes can cause cracks in the chimney that can be dangerous. When the large deposits of soot, which collects easily in an unlined chimney, catch fire, the flames may shoot through the cracks and set fire to the house. This has been the cause of many roof fires. In some instances a chimney fire will not go up the chimney but Will reverse itself and shoot out into the room where the fireplace is, setting fire to the house. The removal of soot is necessary to avoid such fires. The inside of a chimney should have a smooth surface so that soot cannot easily collect there. Flue linings create such a surface. The linings should be made of fire clay or other refractory clay that is able to resist changes in temperature and the chemical action of chimney gases. The smooth linings Will even improve the draft or upward flow of air through the chimney. 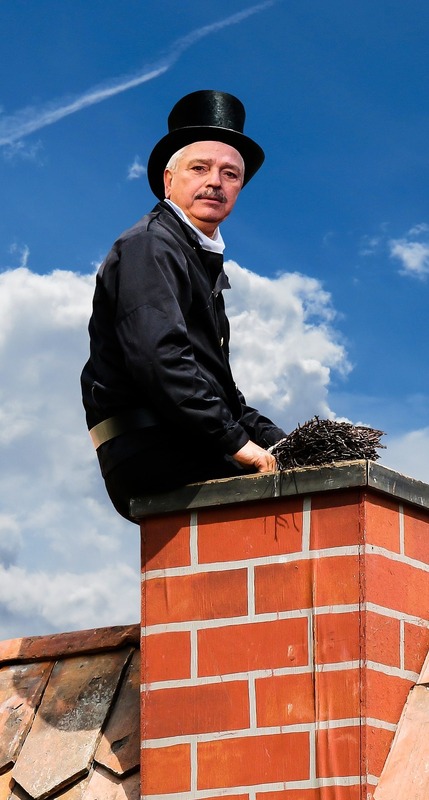 From time to time a chimney should be cleaned of its accumulated soot. The rate at which it accumulates depends upon the type of fuel that is being burned. Eventually, even chimneys with flue linings will gather a certain amount of soot. Once a year the soot should be removed if there are accumulations. This can be done by a chimney sweep, where one is available. If you want to do the job yourself, wrap a brick in an old piece of carpet material. Tie a rope around it and lower the brick into the chimney. It will clean the flue satisfactorily. Attempting to burn the soot out of the chimney, as some people do, is not safe. Other persons may try to remove it with chemicals, but the effectiveness of this method is offset by the danger of. explosions. The use of a carpet-covered brick is a safe method. Inspection of a chimney can be done by means of a flashlight lowered into the chimney on a rope, or it can be inspected from the bottom with the aid of a mirror. When inspecting it, be alert not only for soot but also for the nests of birds, squirrels and bats that may have been built during the summer months when the chimney was not in use. These obstructions should be removed. Check for cracks in the flue lining and in the outside brickwork. If the chimney has no lining, and cracks are found in the bricks, and mortar has begun to fall away from between them, the chimney should be rebuilt. It is better to rebuild a chimney than to use one that is unsafe. A chimney should be built from the ground up, with its weight resting on its own sturdy foundation. If it is an interior chimney, going up through the inside of the house, it will be more efficient than one going up the outside of the house, because it is kept warm. This helps in having a good draft that expels the smoke. The walls of such chimneys need only be four inches thick when flue lining is used, whereas the exterior chimneys should have eight-inch walls. This is needed to protect the chimney from cracking because of winds, storms and frost. The walls of interior chimneys should be thickened to eight inches just below the roof and for the length that is exposed to the weather above the roof. A space of at least two inches should separate the chimney from all wooden beams, joists and flooring. Never should wood studding or lathing be placed against a chimney. Fire-stopping material should be placed in the two-inch space between the chimney and all wood construction. This should be a porous, nonmetallic, noncombustible material such as concrete. When a chimney is encased by a wood partition, the bricks should be given a coat of cement plaster. At the roof the chimney should extend at least two feet above the highest part of the roof. If its height is less than this, a ridge of the roof can affect its operation by disrupting the flow of air around it. A down draft can be created, causing a smoky chimney. Chimneys in houses with flat roofs should extend at least three feet above the roof. The higher chimneys are built, the better the draft will be in them. Extending the height of a chimney is usually the best solution for a smoky chimney, providing that the heating appliance is functioning properly and the chimney is properly designed. The top of the chimney should have a cap of a noncombustible and weatherproof material such as stone, terra-cotta or concrete. The opening should be kept larger than the flue so as not to hinder the draft. A round hue, incidentally, appears to be the best shape as it presents less friction to the heated gases, which tend to rise in a circular column. They do not fill the corners of a rectangular flue lining, making it less effective. But since rectangular flue linings are cheaper to make, they are more widely used. In neighborhoods where sparks could cause fires, spark arrestors should be installed in the chimney. They should be made of a durable material such as nickel alloy, because they usually are not easily reached for replacement. What shortens the life of arrestors made from less sturdy material is the abrasion caused by hot coals and cinders passing by them in the smoke. A smoke test should be given a chimney when it is finished and from time to time thereafter to check it for leaks. This is done by burning paper, tar paper, straw or wood at the base of the flue. When the smoke rises in a dense column, cover the top of the chimney by wedging a wet blanket tightly into the flue. Smoke can then be seen coming out of cracks and other flaws in the masonry if any exist. A well made chimney should show no leaks. By checking your chimney from time to time and by cleaning it of soot, nests and anything else that might obstruct it, you can keep it in good working order. More than that, the time and effort you devote to caring for it will help protect your home from fire. It pays to check that chimney.